Vaisala, a global leader in environmental and industrial measurement, has supplied leading British energy provider Scottish Power with a number of its Optimus OPT100 Dissolved Gas Analysis (DGA) Monitors. The DGA monitors are installed by Elimpus Ltd to provide real-time updates on the transformer condition at key sites. At a site in Scotland's central belt, the OPT100 will give continuous updates on a 1000MVA auto-transformer, helping to protect it against the effects of solar flares: periods when intense high-energy radiation is emitted from the sun's surface, causing radio and magnetic disturbances on Earth. When coupled with local geology, solar flares have the potential to affect power transformers' magnetic circuit, leading to inefficient power transmission and significant damage to the transformers. The OPT100 will monitor for the impact of these currents on the asset, allowing Scottish Power to identify changes in transformer health as a consequence of solar flare activity and carry out proactive maintenance if required. Traditional sampling methodologies have relied on manually-collected samples of the transformer oil, which are analysed in laboratories. By contrast, online DGA allows for greater proactivity in transformer maintenance and reduces the potential for inconsistencies in data analysis. 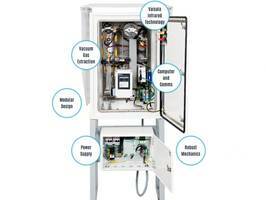 The OPT100 is Vaisala's most advanced transformer monitoring solution, measuring moisture and seven different fault gases in transformer oil. "Scottish Power has a number of strategic transformers on the transmission network that require advanced condition monitoring, and we have been increasingly wary of the effects of solar flares and geomagnetically induced currents to disrupt their efficient performance. The Vaisala unit was installed as it met our current specification of online DGA devices with the addition of being maintenance free," said Keith Black, System Performance Senior Engineer at Scottish Power. "The OPT100 gives us the ability to track any disturbance that may occur and extend the lifetime of our transformer, as well as reducing the possibility of any unplanned outages," he added. With online transformer monitoring set to become increasingly important, Scottish Power are installing more OPT100 units across their fleet of power transformers in the future. Vaisala has long been at the forefront of innovation in online DGA analysis, and has contributed to the incorporation of non-dispersive infrared (NDIR) technology. This ensures optimal condition monitoring performance regardless of operational conditions and enable operators to assess a wide range of gasses. In addition, with no consumables, the OPT100 requires no regular maintenance of its own. "Advances in transformer monitoring including the incorporation of NDIR and online DGA techniques will be crucial not only to preventing catastrophic transformer failures, but also reducing O&M expenditure for operators over the lifetime of their assets," said Product Manager Teemu Hanninen at Vaisala. Vaisala will be attending Low Carbon Networks & Innovation Conference (LCNI), taking place in Telford, UK from 16 to 17 October. Vaisala's technology experts will also be present at the Euro TechCon 2018 fair in Cardiff UK on December 4-6. Vaisala is a global leader in environmental and industrial measurement. Building on 80 years of experience, Vaisala provides observations for a better world. We are a reliable partner for customers around the world, offering a comprehensive range of innovative observation and measurement products and services. Headquartered in Finland, Vaisala employs approximately 1,600 professionals worldwide and is listed on the Nasdaq Helsinki stock exchange.